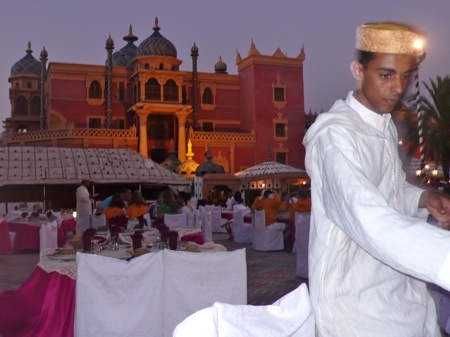 Marrakech Travel Agency – An Evening At The Chez Ali Fantasia Show in the Marrakech Palmary, Your Morocco Travel Guide. 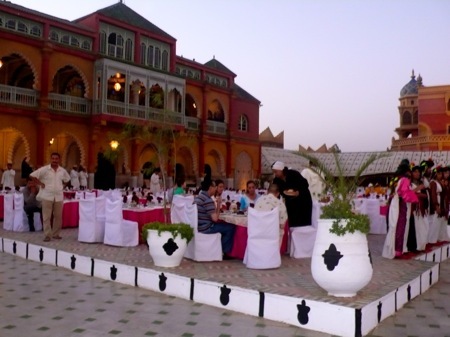 One of the most exciting ways to spend an evening in Marrakech when touring with a Marrakech Travel Agency such as Travel Exploration is to attend the Chez Ali Fantasia Dinner Show at Al Kasbah in Marrakech’s Palmary. The Chez Ali Fantasia show at Al Kasbah is a Moroccan Travel equestrian spectacle and a must see for those who enjoy Moroccan Moroccan music and Moroccan food. In fact the Chez Ali Fantasia show is also attended by local Marrakeshi’s and Moroccans who come to Marrakech for vacation. Attending Chez Allez guarantees an Absolute Morocco experience. The Chez Ali Fantasia show at Al Kasbah takes place on two sprawling acres in the heart of the Marrakech Palmary. The Marrakech Palmary is an enchanting spot where Moroccan palms are set alongside old and new villas and traditional Moroccan Riads. The vast gate of Al Kasbah’s Chez Ali Fantasia Show, The “Borj”, overlooks the Agora, a courtyard where the shows are performed. From Al Kasbah’s Berber setting, you can admire the palm grove, alongside the Atlas snow-capped mountains that embrace Al-Kasbah to provide a magical view. The Chez Ali Fantasia dinner show boasts a restaurant and dining experience that has been designed in a modular fashion and is equipped with individual fireplaces that let guests enjoy dinner in a warm and intimate atmosphere in the cooler seasons. 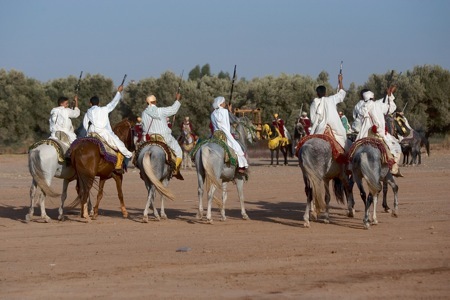 The Chez Ali Fantasia Show begins with Arab stallions that rush in a simulated charge at the end of which their expert riders shoot up in the air (“Baroud”) with their “Moukahla” rifles while they bring their horses to a spectacular quick stop. See and hear the bee dance from El Kelaa M’gouna, a village located in the Valley of Roses and Ahmed E Moussa warlike acrobats to the wistful chants of Haouz, Ahouaches, and Gnaouas and also the incredible high pitched singing style of the women from Imintanout. During dinner, made up chiefly of Moroccan harira, méchoui and couscous, you will have the opportunity to appreciate the Berber folkshow, the performanceof jugglers, the flying carpet, the belly dance and, last but not least, the fantasia show. 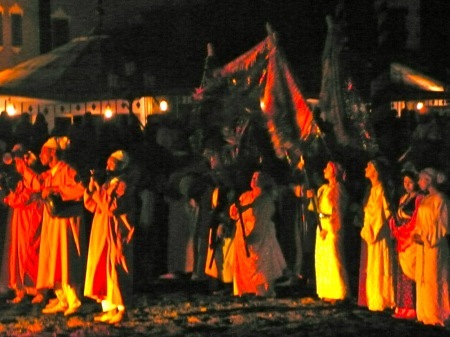 This is a spectacular evening and event worth every moment for Moroccan Travelers. 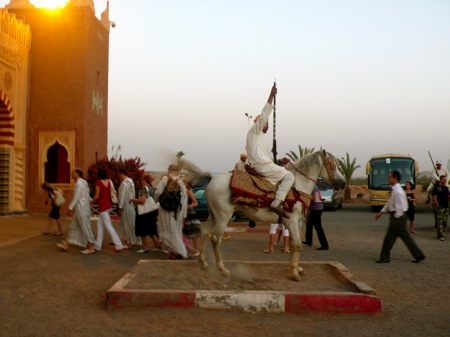 Travel Exploration specializes in Morocco Travel. We provide Tours and travel opportunities to Morocco for the independent traveler and tailor-made tours for families and groups with a distinctly unique flavor. From Morocco’s Seven Imperial Cities, to the Magical Sahara Travel Exploration offers a captivating experience that will inspire you. At Travel Exploration we guarantee that you will discover the best of Morocco! Google on call Travel Exploration at 1 (800) 787-8806 or 1 (917)703-2078 and let’s book a tour to Morocco for you today. You are currently browsing the archives for the Fantasia Marrakech category.